This was about as bad as a football game could get. Despite the score, the Bengals didn’t really do much. They didn’t have any extended drives or big plays other than the first A.J. Green touchdown. They were brutally efficient, however. Anytime they got the ball in Giants territory, they converted, and they got the ball in Giants territory way too much. The Bradshaw fumble was an absolute killer. Up until that point, I still thought the Giants were in control. Then, Eli starts treating the ball like it’s a hot potato and the game is over. Not giving the ball up has been key to the Giants’ good start so it’s baffling why they would start doing it against an also-ran like Cincy. This is the first time all year that they really seemed like they were pressing and I hope it’s not because of what people are saying in the press. Who knows what the “problem” with the Giants is? I think Eli’s struggles are overrated. The offensive line struggled a lot and didn’t give him much time. Perhaps Snee’s injury is a concern. The dropoff from Sean Locklear to David Diehl might also play a part. I love Diehl. He’s a Champion, but at a certain time, you have to move on. That’s something Coach Coughlin is going to have to think about during the BYE. And can we please get some more Andre the Giant? He is killing it every time he gets the ball. I don’t think Bradshaw is toast but I really feel that the Giants are a better team when Brown gets a majority of the carries. Whether or not he blocks as well is another aspect, but this is another thing to analyze over the BYE. The Giants need a spark and he could be it. As a Giants fan, you still can’t complain. Your team is in first place by a game-and-a-half and the rest of the teams in the division look like clowns. Still the last two games were so uncommon for what we’re used to. Or is it? 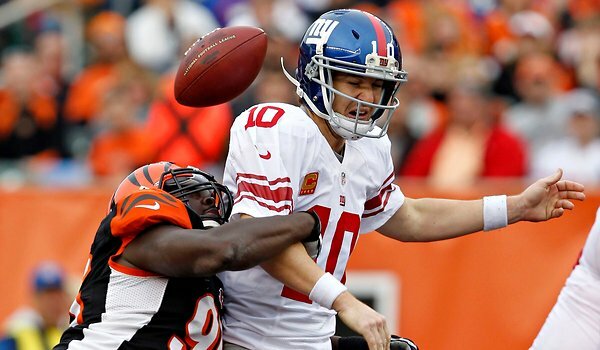 Is this just the second-half swoon that the Giants always have for some bizarre unknown reason? Or is 10 games in a row without a bye for an injury-depleted team just too draining? These guys better get their rest on and a few reinforcements, like Kenny Phillips, back because the first game up is against Green Bay and they’re definitely gonna be in a bad mood.